At a remote atoll in the middle of the Pacific, scientists are working to save the seals. At just over a kilometer long, Tern Island served as an airstrip during the Second World War. Today, it’s one of the last bastions of Hawaiian monk seals. For the past 30 years, scientists from the US government’s Hawaiian Monk Seal Research Program have been coming to this atoll—one of eight sites in the Northwestern Hawaiian Islands used by the team in its efforts to save the endangered seals. With a global population of 1,100, the Hawaiian monk seal is one of the most endangered marine mammals in the world. It is also one of the most elusive, living primarily throughout an archipelago that stretches more than 1,700 kilometers northwest from the main Hawaiian Islands. Over the past 30 years, the population of monk seals has dropped by more than 20 percent. But this year—at least for the short term—the seals’ fortunes seem to be turning. Favorable climatic conditions and human-led conservation efforts have coincided, resulting in a surge of seal pups. In the 2015 pupping season, 15 percent more seals were born than in 2014, a rise that has reversed a four-year decline. Across their narrow range, monk seals face numerous threats. The program has responded, says lead scientist Charles Littnan, by adopting a decidedly hands-on approach. More than 30 percent of Hawaiian monk seals alive today are the result of human help, he says. Help can mean removing hooks, fishing line, and other marine debris; rehabilitating malnourished pups; or translocating pups to habitats that increase their chances of survival. That intervention has slowed the annual decline of the species from eight percent in the 1980s to 2.8 percent in the past decade. These efforts are critical to the monk seal’s survival, but working in the middle of the North Pacific on an unprotected atoll comes with extreme challenges. This season, scientists face an unusually active hurricane season, thanks to El Niño’s pulse of warm water to the North Pacific. With the potential onslaught of high winds and towering waves hammering their Tern Island research station, the team was forced to pack up in late August. But now, two weeks later, the winds are calm and the team has returned to finish their work. After unloading their gear, two of the four biologists hop back into the boat and head out to survey the seals. The others head for one of the remaining dilapidated military buildings, where a whiteboard shows a tally of recent seal births. Before being interrupted by the hurricane, the team had documented 38 monk seal pups. When they return from the afternoon’s survey, they add two more. Recent weather, and the conditions in the ocean, have made this a good year for seal pups, says Littnan. Even the hurricane-enabling El Niño has been good news. “We don’t really understand what the biological mechanism is, how it translates to more food, but El Niños tend to be very beneficial to monk seals,” he says. Another potential cause behind the baby boom, says Littnan, is the Transition Zone Chlorophyll Front—an ocean-wide, nutrient-rich zone that migrates north and south year to year. This year, it’s dipped incredibly far south, bringing a burst of productivity to the Northwestern Hawaiian Islands. 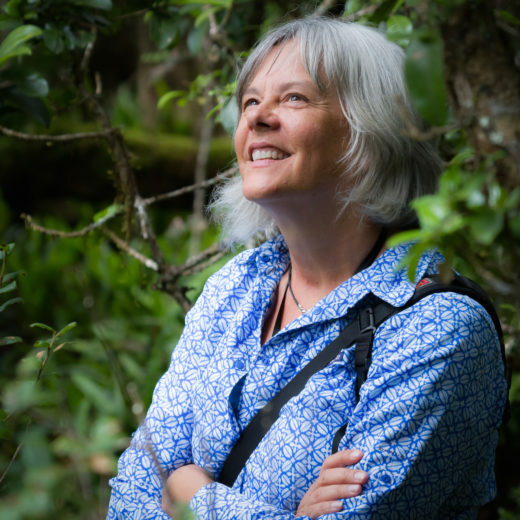 A 15-year resident of Hawaii, Kim Steutermann Rogers has been known to shadow scientists deep into rainforests and throughout uninhabited atolls in the quest to learn more about Hawaii’s endemic—and often endangered—flora and fauna. But, most days, she sits in a chair and writes about what she’s learned. Kim holds a Bachelor of Journalism from Missouri School of Journalism and a Master of Fine Arts in Nonfiction from Antioch University Los Angeles. Cite this Article: Kim Steutermann Rogers “Hawaii’s Highly Endangered Monk Seals Are (Finally) Having a Good Year,” Hakai Magazine, Sep 17, 2015, accessed April 23rd, 2019, https://www.hakaimagazine.com/news/hawaiis-highly-endangered-monk-seals-are-finally-having-good-year/. An endangered bird’s future looks bright as 10 get set to take flight.